Near Mount Rogers and Whitetop Mountain, Virginia's two highest mountains, Grayson Highlands offers scenic views of alpine-like peaks more than 5,000 feet high. Facilities include a visitor center, campgrounds, and hiking trails leading to waterfalls and overlooks. Scenic horse trails and a horse camping area with electric and water hookups, stables and parking for trailers are available. 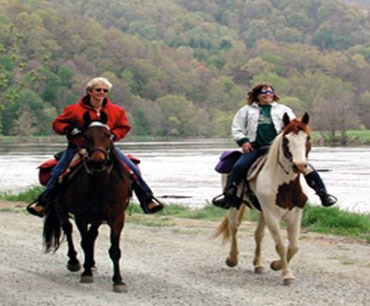 The park provides year-round access to the Appalachian Trail and the Virginia Highlands Horse Trail. The 34.3-mile Virginia Creeper Trail was named after the steam engine that once creeped up the rails into the Iron Mountains. Also, a plant called the "Virginia Creeper" grew along its tracks. By the 1970s, many railroads were abandoned. And in 1986, the Rails-to-Trails Conservancy began converting old railroad beds into trail systems for hikers and bikers. The most common activity for first time visitors is biking the section from Whitetop Station to Damascus. 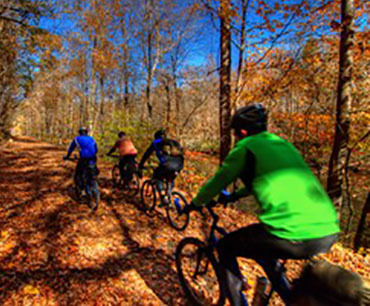 Bike rental companies in Damascus and Abingdon will shuttle you to the top of the mountain for an easy ride down to Damascus. The Appalachian Trail is a 2,180+ mile long public footpath that traverses the scenic, wooded, pastoral, wild, and culturally resonant lands of the Appalachian Mountains. Conceived in 1921, built by private citizens, and completed in 1937, today the trail is managed by the National Park Service, US Forest Service, Appalachian Trail Conservancy, numerous state agencies and thousands of volunteers. Access to the AT is close at hand so you can enjoy hiking/backpacking part or all of the Trail starting here. 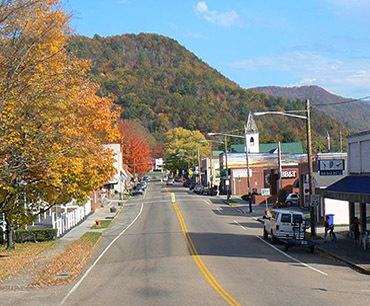 Damascus, Virginia, is a small town in the Blue Ridge Mountains, and is the gateway to the Mount Rogers National Recreation Area. 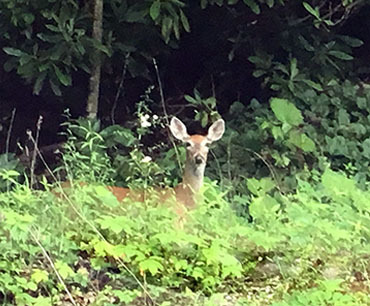 It is traversed by the Appalachian Trail, the Virginia Creeper Trail, the Trans-America National Bicycle Trail, the Iron Mountain Trail, the Daniel Boone Heritage Trail, the Crooked Road Musical Heritage Trail, Virginia’s Birding and Wildlife Trail, and lies within a short distance of hundreds of miles of other hiking, horse, and biking trails. The town is becoming a major tourist destination for those seeking a way into the wilderness. You are invited to visit, ride a bike through our forests, walk beside a mountain stream, and make yourself at home. If you want the most consistent snow in Virginia, you head to the highest elevations in the state. 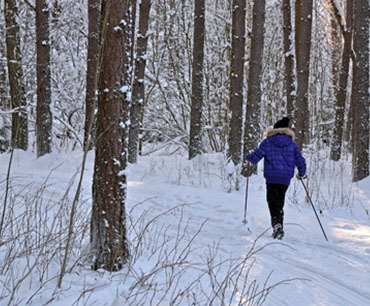 Grayson County, home to Mount Rogers and its surrounding 5,000-footers, is known as the “roof of Virginia.” It’s also home to arguably the best cross-country skiing in the state. 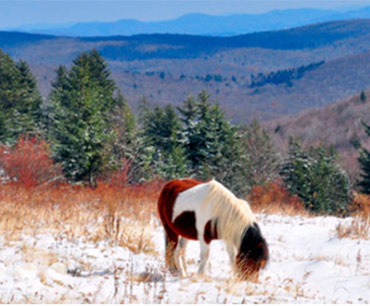 Grayson Highlands State Park has ten miles of designated cross-country trails zig-zagging across 5,089-foot Little Pinnacle Mountain, which typically has enough snow to support the skinny-ski traffic during the coldest winter months. Bring your own or rent one here. Either way, there are great trails in these mountains for enjoying a wonderful ride on your favorite (or new favorite) horse. Plenty of places to choose from around here, so enjoy! 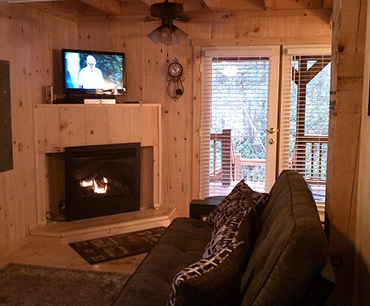 Our cabin gives you all the comfort of home without any of the day-to-day hectic pace. Sit back and relax as you enjoy your getaway from the hectic pace of life. Enjoy the beautiful natural setting. Breathe deeply of the fresh, country air. Relax. You're on vacation.